The Bunch bottle holder resembles the shape of a bunch of grapes. 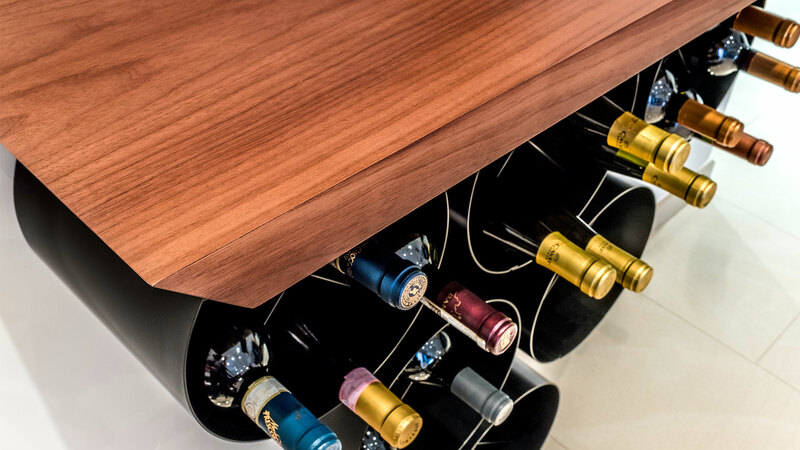 The bench top, featuring a solid wooden wine glass holder component, represents the “stem” of the bunch, the steel sheet bottle holder elements symbolise the “grapes”. Designed in 2016 by Marco Di Properzio, it was originally created specifically as a one-off piece for his home in Rome. In 2017, following the various positive appraisals that the piece received, he decided to mass-produce and market it, while maintaining the aesthetic and constructive features of the original. 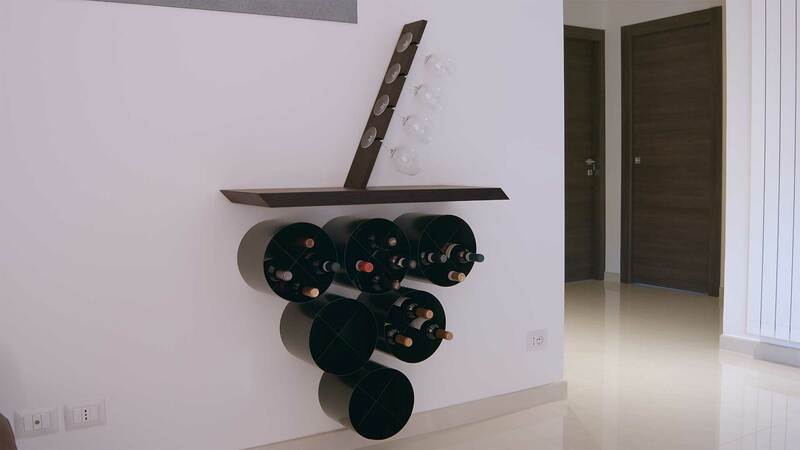 The product offers several functionalities, initially designed as a bottle holder/wine glass holder, it can also be used as a bookcase/magazine holder and most commonly as a catch-all. 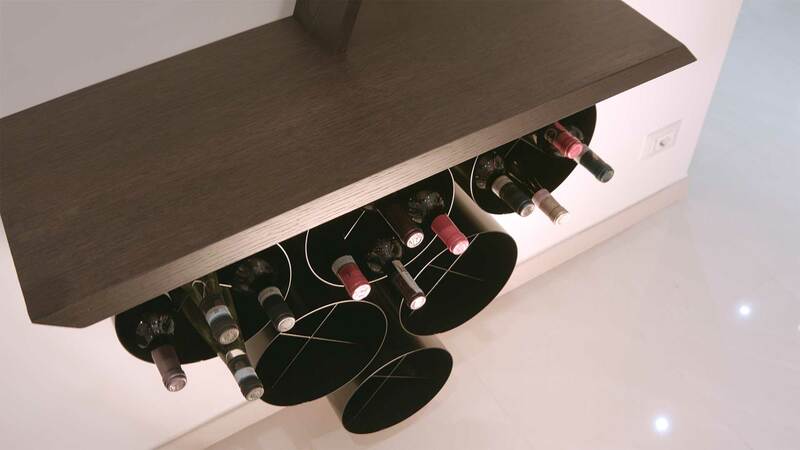 The bottle holder elements and the wall-mounted bench feature ad hoc concealed fixtures, which create a sensation of lightness. 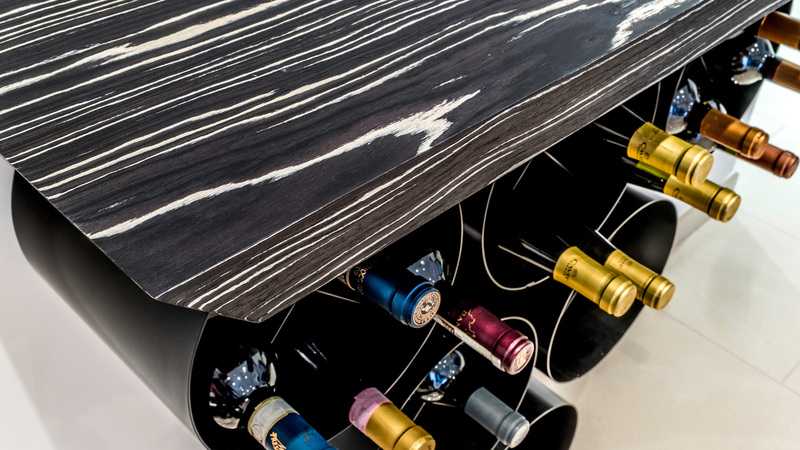 Each element is equipped with an internal partition, the whole product can hold up to 24 bottles, the upper hardwood element can hold 4 glasses. Bench top: made from 39 mm thick veneered wood, with dark oak, canaletto walnut and black flame finishes. 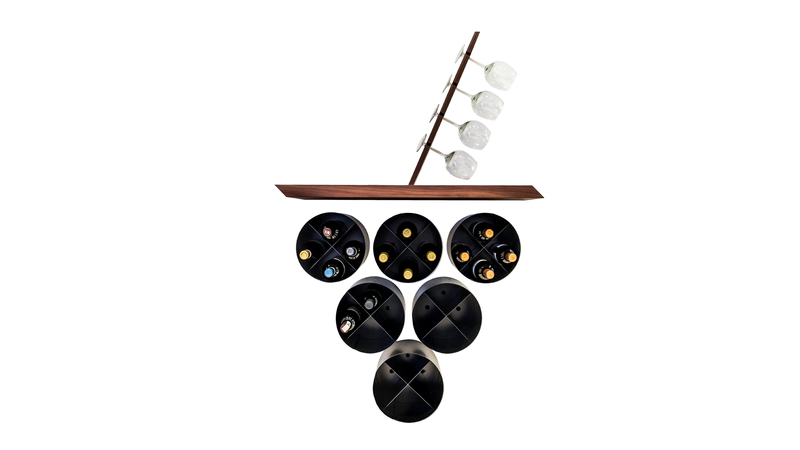 Wine glass holder component: : in solid dark oak or canaletto walnut wood. Or in veneered wood with a black flame finish. 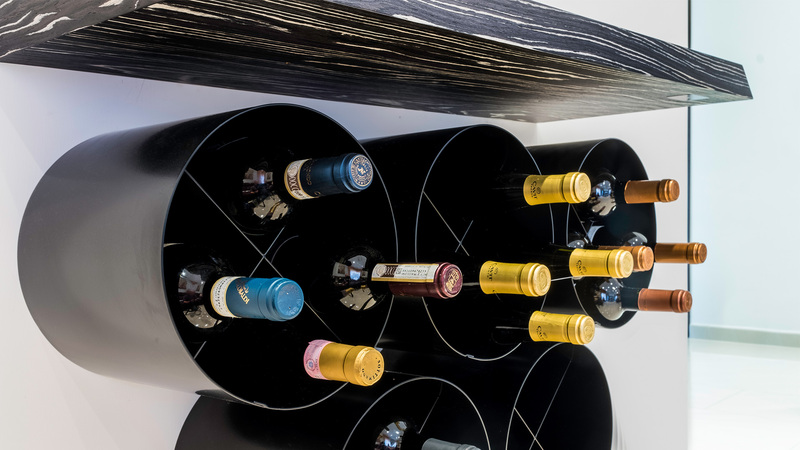 Bottle holder element: bent steel sheet with epoxy powder paint finish. 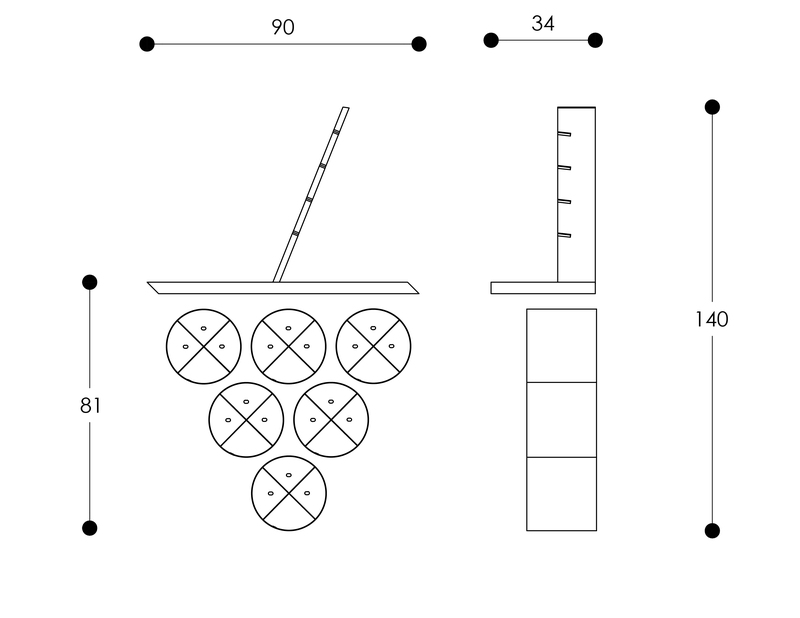 the sequential number, which identifies the object in connection with its “Identity Card”, which certifies the final quality-control check. 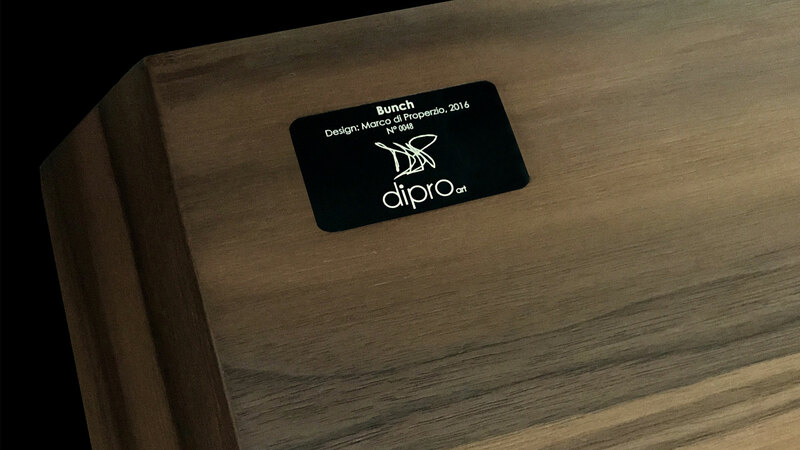 In addition to the distinctive symbol of authenticity of the Dipro art brand (which includes the sequential production number, the creators’ signatures and the logo), each product is accompanied by a certificate that features the same sequential production number that is displayed on the mobile. 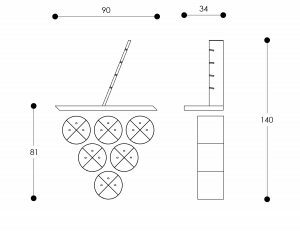 The document contains information regarding the product features, such as the materials used, the interpretive criteria adopted, year of origin, year of production and biographical information about the Designer.